Mischievous, maddening, and always poised for action, squirrels seem to always be one step ahead of gardeners when it comes to the damage they inflict on our flower and vegetable beds. Rarely does any one single method achieve complete squirrel control, but with some persistence and a multi-pronged approach you can put a damper on the havoc these rodents wreak in the landscape. What Plants Do Squirrels Eat? Squirrels relish many of the same plants that we do, including fruits and vegetables, seeds, nuts, and berries. They will also make quick work of tulip bulbs, and even tulip blossoms. However, there are many plants that squirrels find distasteful, or are even toxic to squirrels. Replace tulips with spring-flowering bulbs that squirrels ignore, including fritillaria, daffodils, and crocus. Some plants have developed a defense mechanism of bitter or toxic sap to stop animals from eating them, so include these in your beds, borders, and hanging baskets. Squirrels ignore petunias, marigolds, and herbs with volatile oils, such as mint and rosemary. Like all wild animals, squirrels are opportunistic, and will take advantage of the proverbial low-lying fruit in your landscape. Bird feeders are one of the biggest squirrel attractants, and it doesn't matter if your feeder is the Fort Knox of squirrel-proof feeders, as seed will always spill onto the ground. You don't have to give up on feeding the birds, but switching to less palatable feed like safflower seed or seed treated with cayenne pepper can deter hungry squirrels. Keeping the garden clean can also discourage squirrels from gathering. After the harvest is over, remove any dropped fruits or vegetables from the ground. Don't forget to clear away other foodstuffs that attract squirrels, like leftover pet food and dropped acorns or black walnuts in the landscape. What about pet cats and dogs? The sight of a predator lying nearby may temporarily deter squirrels, but all pets must sleep, and the quick rodents will continue their damage during these catnaps. Additionally, cats and dogs can create their own nibbling and digging damage in the garden. There are many squirrel repellants on the market, but most of them are based on predator urine or hot pepper. Homemade recipes may also include garlic or onion, vinegar, or peppermint oil. Repellants may have some success used in conjunction with other deterrents, but gardeners must be vigilant about reapplication. Wind, water, and sunlight will cause repellants to break down quickly. Repellants also have the disadvantage of repelling the gardener. Do you want your rose garden to smell like coyote urine and onions? Fencing has a lot going for it as a pest exclusion device for any animal, but fencing can also be expensive and unsightly for larger areas. Cage is a more accurate term than fence, as no fence can keep out the agile squirrel. Although squirrels have the ability to overcome a very sturdy barrier with their digging and gnawing, a floating row cover is surprisingly effective as a barrier in the vegetable garden. Squirrels do not like the feeling of enclosure, which would prevent their ability to sprint away from a predator. Fierce resin owls and creepy black rubber snakes seem to populate the garden aisle every spring, giving gardeners the promise of scaring the squirrel out of his wits. Faux predators may have some limited effectiveness, but you must provide the animation they lack by moving them around every day. 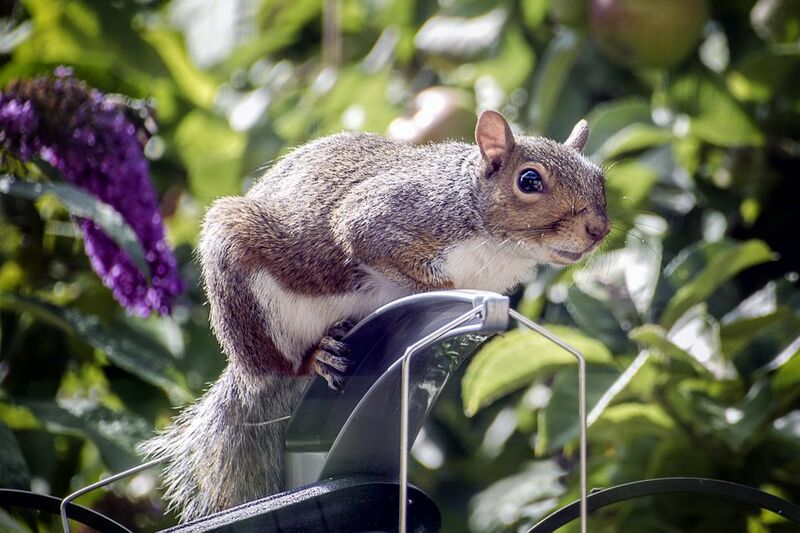 Ultrasonic noisemakers and motion sensor sprinklers may give squirrels a start, but rapidly decrease in effectiveness over time. As urban animals, squirrels have adapted to live alongside all kinds of noises and other stimuli. In wooded areas or those adjacent to parks, it becomes impossible to exclude squirrels, and in these places it makes more sense to protect individual plants from squirrel damage. It may seem like a lot of work, but as a bonus you will also be preventing damage from mice, voles, groundhogs, birds, rabbits, and deer. Metal mesh cloches are ideal for young vegetable plants, especially leafy greens. You can buy handsome antique replicas, or create simple DIY cloches with chicken wire. Sink additional chicken wire over freshly planted bulbs to prevent digging. Aluminum flashing works well for wrapping tree trunks, and also prevents squirrels from running up trees. Paper bags will enable sunflowers to fully ripen without molestation. Old stockings or cheesecloth can prevent squirrels from one of their most infuriating practices: taking a single bite from a ripening tomato, and then abandoning the spoiled fruit.